Careers clinic: Do you have a portfolio career? TheJournal.ie’s resident careers guru Liam Horan looks at portfolio careers as a possible way to flesh out a part-time working week. 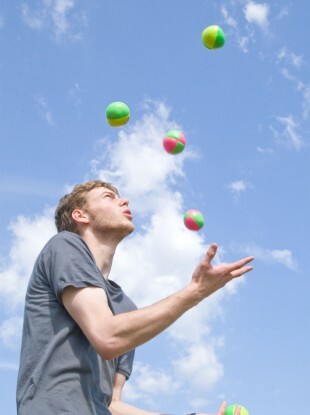 A portfolio career can be a real juggling act. IS 2012 GOING to be the year that you will change the direction in your working life – and by choice or by circumstances? ‘Portfolio careers’, which is not a title I particularly like, are something many people are currently either enjoying or enduring – and the reality is that they are likely to become more commonplace in the future. For those who don’t know, forgive us our Del Boyisms, but a portfolio career is ‘a bit of this, a bit of that’. Twenty years ago, management guru Charles Handy predicted that workers would be in greater control of their careers by working a multiplicity of small jobs rather than just one big job. Handy forecast that more than 50 per cent of jobs would be something other than full-time. This reality is manifesting itself for what I believe to be a growing number of people in Ireland today, which is a significant shift given our traditional attachment to the ‘steady job’. A considerable number of my clients have developed portfolio careers – often without realising the phenomenon has a name – in response to being laid off or struggling to find a full-time job. Whatever other pieces of work come their way in the course of the week – some flyers for an occasional client, a logo for a new customer, a new website build, and sundry other small jobs. That particular mix, as you can see, involves pairing regular work, perhaps even staffed, with some more random earnings. Many people with portfolio careers could be described as ‘half staff, half self-employed’: it is often the case that the portfolio career is thrust upon them when their staff job is cut back from five days to three. People currently on the look out for work need to be flexible, and react to the changed circumstances. Companies may not wish to commit to you straight off, but might be happy to give you some work to show your worth. Other companies are unlikely to have enough work to warrant a full-time position, but still need certain functions fulfilled, and look to outsource providers to bridge the gap. If you get enough of that kind of work, you can tide yourself over until you gain a full-time position. But not everyone craves the full-time ‘permanent and pensionable’ either. The attractions of the portfolio career can grow on you – the freedom from the tyranny of the five-day week in the office, the escape from the soft talk at the fabled water cooler, the prospect of working from home, less of ‘the boss’, the adrenalin that pushes you to modify what you do to hook in more customers, and general lifestyle improvements that could tie in with your family needs. If you can stick the pace, and if you don’t get stung by people who owe you money, you might find it a very attractive alternative to full-time employment. It’s not for everybody, clearly. It can be all-consuming, thereby killing the very lifestyle benefits mentioned above. It is not always necessary to have a portfolio career in the same sector. The graphic designer might also do a day teaching English as a foreign language. One of the more curious examples I’ve heard of a man who split his time between running a roofing business and lecturing on media aesthetics. He was qualified to do both, I hasten to add. If you’ve got some interesting portfolio career ‘stuff’ going on, let us know in the comments section. You’d never know, you might even find another customer to help you piece the weekly jigsaw together. Liam Horan runs career training company Sli Nua Careers, who offer mock interviews via Skype. For more details, visit www.slinuacareers.com. Email “Careers clinic: Do you have a portfolio career?”. Feedback on “Careers clinic: Do you have a portfolio career?”.